John Wayne (May 26, 1907 – June 11, 1979) was an iconic American actor. Mr. Wayne was best known for playing leading roles that showcased courage, integrity, and heroism. He was tall with broad shoulders, a muscular build, and a slightly gravely, resonating voice. His patriotism and love for America became deeply associated with his very persona. Below are John Wayne cardboard cutouts (also called "standups") for sale on Amazon and eBay. Note: Even though many of the cutouts below are described as "life sized," that term is often used loosely as a general description. The cutouts below vary in size and may, or may not, actually be life-sized. Below: A life-sized (or close to it) John Wayne Cardboard cutout. Below are a few good things to know when buying a John Wayne cardboard cutout on the Web or anywhere else. How tall and wide is it? Be sure you know actual measurements, and don't rely on general phrases such as "life sized." What is it made of? Cardboard is common, but so are other materials such as foam board. 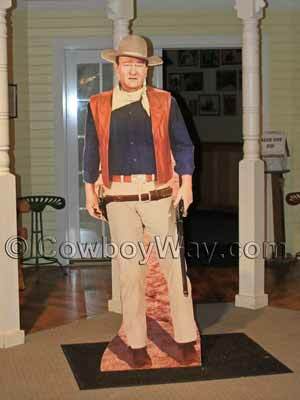 How is the John Wayne cardboard cutout made to be displayed? For example, it's common for a cardboard cutout to come with a built-in easel on the back that simply folds out so the cutout can stand on the floor on its own. However, while this method is common it isn't a given. Know how a cardboard cutout you're considering buying is meant to be displayed and decide if that will work for your needs. How long will it take before your cardboard cutout is shipped? We've seen several on Amazon and eBay that were ready to ship right away, while others may take several days or even longer. Where will the cutout be shipped from? How long will it take to arrive? Is shipping included in the price, or will it be extra? 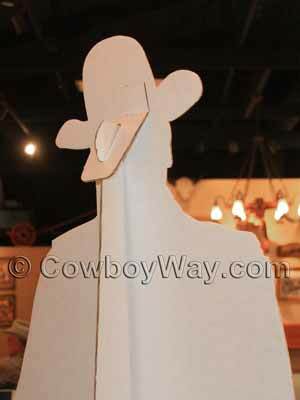 Below: The back side of a John Wayne cardboard cutout showing a built-in easel that allows it to stand on its own. Marion Morrison, who later would become world famous with the name John Wayne, was born in the family home in Winterset, Iowa in 1907. He was known later in life as a large man, and it seems he got a head start on his size from the day he was born: He weighed 13 pounds at birth. In 1916 the Morrison family moved from Iowa to California where Marion graduated high school and attended the University of Southern California on an athletic scholarship. He attended college and played football until he lost his scholarship due to a surfing injury that ended his college football career. By that time, however, he had already begun working at local film studios for the props department and also appeared onscreen as an extra. In 1930 Marion Morrison landed his first starring role in the movie "The Big Trail." This was also the first movie in which he used the name John Wayne, the name he would use for the rest of his career. His movie career moved forward slowly from that point for several years. After "The Big Trail" he appeared in more than 70 additional movies, including a long list of low-budget Westerns. It was in the 1939 Western "Stagecoach" that John Wayne was cast as the Ringo Kid. It proved to be his breakout role. His famed movie career continued for nearly forty more years, mostly as an actor but also as a producer and director. While his career had its ups and downs, his triumphs far exceeded the low spots. While starring in and excelling at numerous different roles, John Wayne became best known as the quintessential movie cowboy and war hero, and one of the best recognized symbols of America at home and abroad. After the Morrison family moved to California when young Marion (later known as John Wayne) was just a boy, the story goes that he loved to take walks with the family dog, an Airedale named Duke. Young Marion and Duke were each other's constant companions, and pretty soon people who knew them began calling Marion "Duke" just like his dog. The nickname stuck for the rest of his life, and while movie fans all over the world knew John Wayne as, well, John Wayne, his friends and family called him Duke.